If I had to pick a favorite food on the planet, it would have to be toast. Before you accuse me of being boring, hear me out. I'm not talking about just any any toast. I mean the kind made with really good, grainy bread, filled with seeds, nuts and/or dried fruit. (For the record, cranberry pecan toast is my all-time favorite, slathered with salted butter and apricot jam. Second favorite? Smashed avocados, lemon, and red pepper flakes on wholegrain toast.) The possibilities are limitless – you can top toasted bread with just about anything, and call it a meal. I eat toast for breakfast daily, and usually for lunch, too. And I freaking love it. 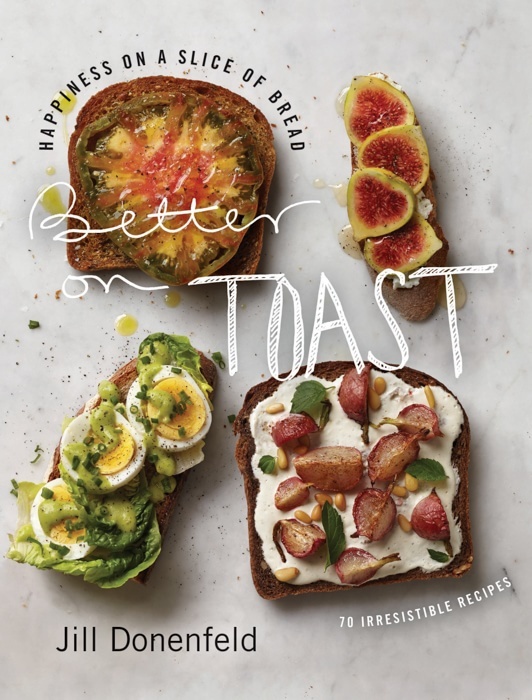 Her beautiful new book Better On Toast: Happiness on a Slice of Bread just came out today, with 70 fantastic toast-centric recipes that I can't wait to try. (Also: beautiful photos, creative meal ideas, and even toasting tips. Who knew: a toaster isn't actually the best way to toast bread?!) 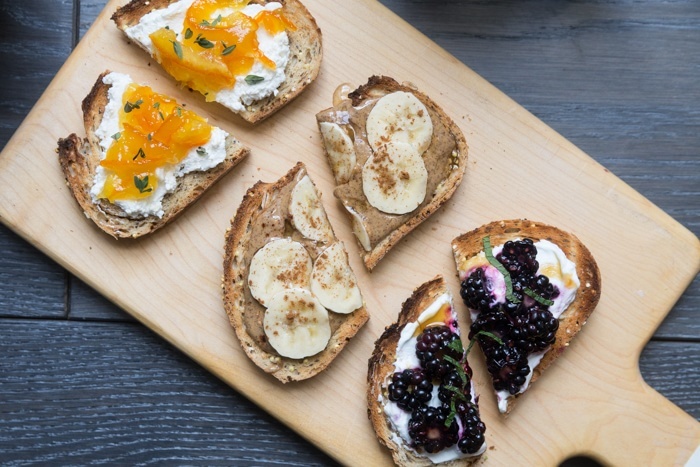 Of course, there are plenty of breakfast and "snack" toasts (like Ricotta with Lavender Honey, Classic Avocado, and Smoked Trout with Grapefruit), but Jill also offers some hearty toast recipes that would be great for dinner, like Marinated Shrimp, Celery, and Green Onion, or Chickpea and Chorizo. A huge veggie lover as well, Jill has some lovely vegetarian toasts like Roasted Eggplant with Raisin Chutney and White Bean Avo that sound amazing. 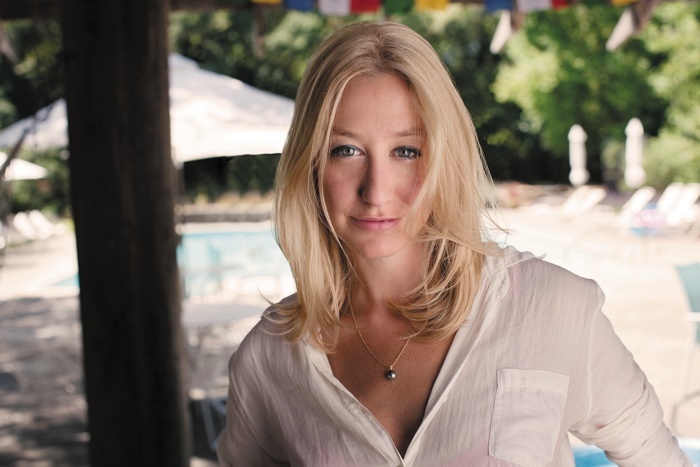 Brilliantly, she offers a section at the end on what to do with leftover bread, with recipes for Panzanella, Bread Pudding, and a bunch of clever "midnight snacks" (bottarga, anyone?!) Also, for all you gluten-free peeps, Jill has a fantastic recipe for quinoa-millet bread, so you can enjoy the recipes in this book as well. In the spirit of toast, I agreed to share a few of my own favorite toast ideas, as part of Jill's virtual Toast Party. Though I firmly believe toast can be enjoyed at any time of day, I stuck to breakfast just because I really, really love eating toast for breakfast. Rather than writing out actual recipes, I'm just going to give you the flavor profiles and you can put as much or as little of each ingredient as you like. I made these toasts with Whole Food's 'Seeduction' bread (you can find it in their bakery) – it's packed with grains and seeds, and toasts really well. Each one is delicious on it's own, but it's also fun to make up a bunch of toasts, cut them in half, and serve as part of a breakfast or brunch buffet with a big pot of coffee. 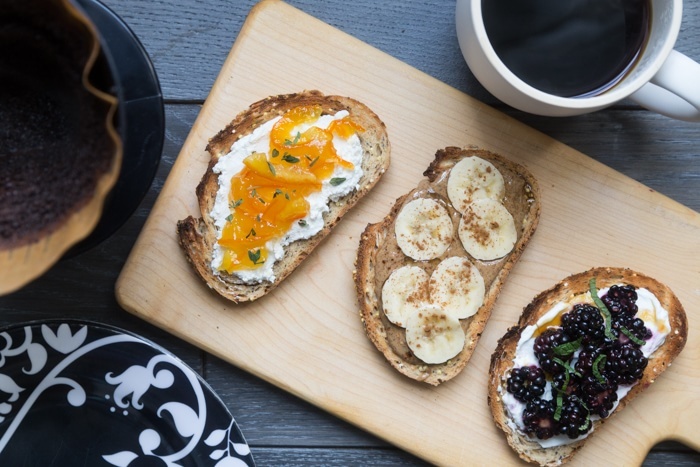 I hope you enjoy these easy breakfast toast ideas, and in the meantime, enter our drawing to win a free copy of Jill's book! All you have to do is follow Jill and me on Instagram (@theculinistas / @annawatsoncarl) and Facebook (The Culinistas / The Yellow Table), and comment below with your favorite way to eat toast! P.S. For more fun, head over to Feed Me Phoebe, Hungry Girl Por Vida, and Good and Cheap - the toast party continues!